Trolex Engineering design and manufacture Electrical Slip Ring Units for use in a range of applications, such as cranes, wireline/logging, ROV's and winches. Our Slip Ring Units can be combined with Fibre Optic Rotary Joints or Air Swivels, transferring electrical power, command and control signals across a rotating interface. They can be used in any electromechanical system which requires unrestrained, intermittent or continuous rotation whilst transmitting power and/or data. Our Slip Ring Units are available for internal or external mounting interfaces, for uninterrupted supply of voltages up to 11kV and currents of 3,500 Amps for power, combined with signals, video and fibre optic passes, as required. 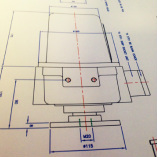 In addition to our standard range of products, we offer a design service for bespoke applications. Please get in touch for more information.